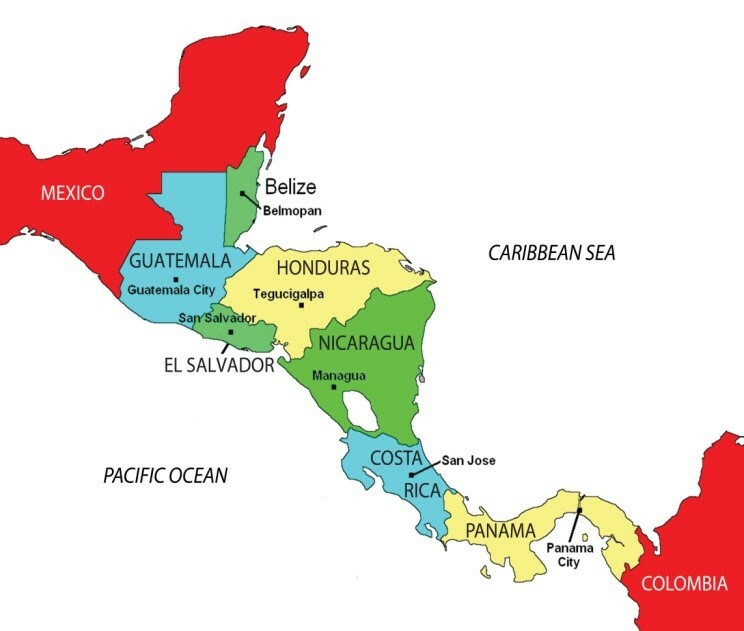 The Central American region is comprised of six countries, excluding Belize, being Guatemala, El Salvador, Honduras, Nicaragua, Costa Rica & Panama. The combined population size is around 45.3 million people (0.6% of the global population). The combined GDP of the region is US$209 billion, with Guatemala having the highest GDP of US$58 billion and Nicaragua with the lowest at US$11 billion. The United States has historically been the main recipient of Central American exports. This relationship was strengthened with the signing of the CAFTA-DR free trade agreement in 2005. Its second largest market is the European Union accounting for 22% of its exports. However, the region itself still remains as one of Central America’s most important market. Total intra-regional exports and imports in 2016 accounted for US$6.7 billion and US$7 billion respectively. 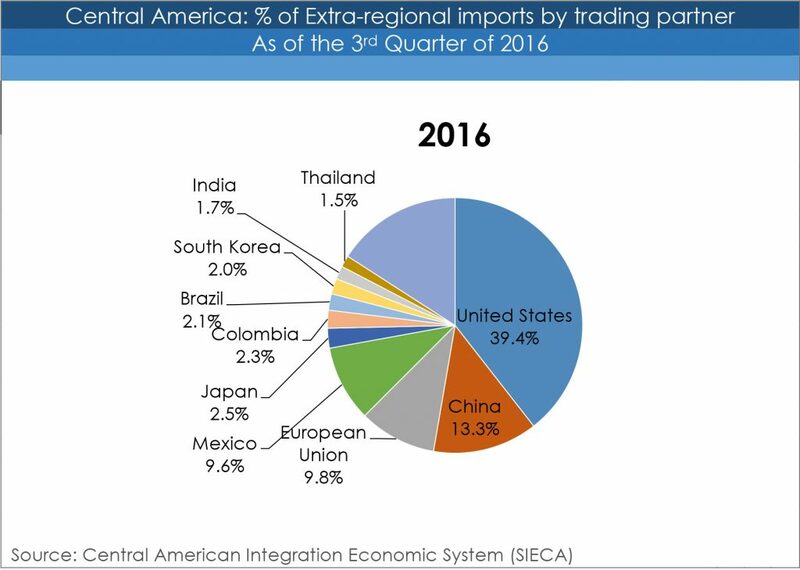 The total value of Central American exports in the third quarter of 2016 was US $ 21,142.0 million of which 32% were destined for the intra-regional market and 68% corresponded to extra regional trade. The main goods exported to extra-regionally are: coffee (14.9% of the total); bananas (12.1%); the instruments of medicine, dental surgery and veterinary (10.1%); sugar (7%); and dates, figs, pineapples, avocados, guavas, mangoes and mangosteens (4.9%). During the third quarter of 2016 the value of Central America’s total imports was US$ 48,501.9 million. Extra-regional imports were led by petroleum or bituminous mineral oils (11.8% of the total); Passenger cars for passenger transport (5.1%); Medicaments consisting of mixed or unmixed products (3.4%); Cell phones and wireless networking equipment (2.9%); And vehicles for freight transport (2.1%). Among the top 10 extra-regionally imported products is corn, at a value of US$601 million as of 2016. The 5 main products exported to the intra-regional market were medicines (5.4% of total); articles of plastic for packaging (3.7%); bakery, confectionary o biscuit products (3.2%); water, including mineral and aerated water (3.2%); and food preparations (3.1%). 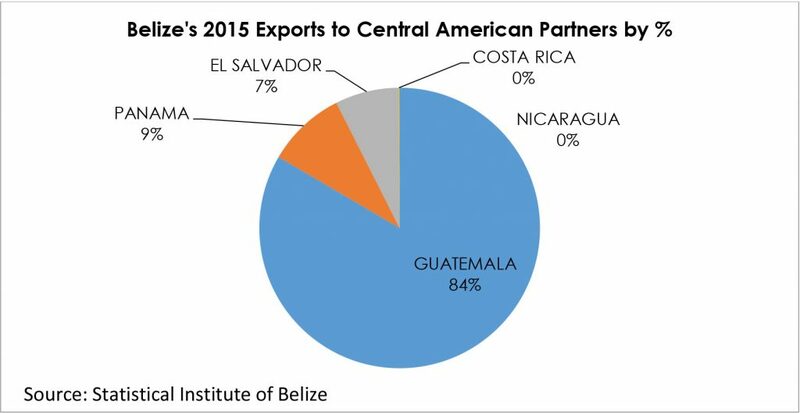 The Central American region accounted for 4% and 19% of Belize’s total exports and imports respectively in 2015. Belize’s top exports to Central America in 2015 were shrimps, complete animal feed, red kidney beans, orange concentrate and citrus oil. 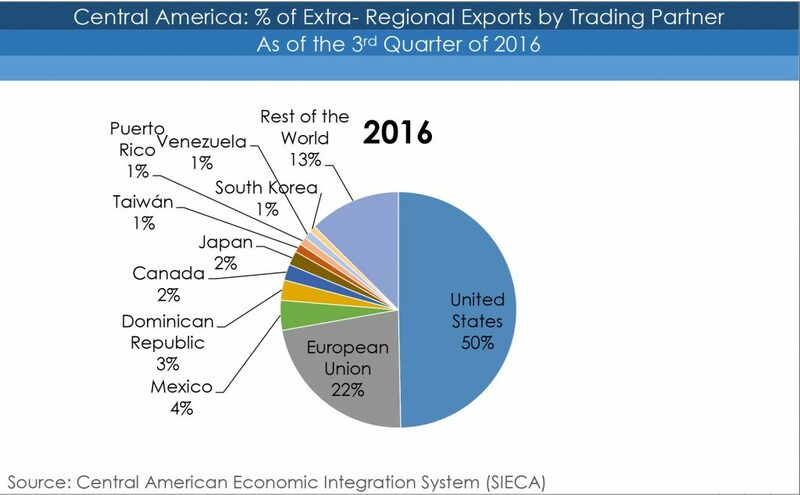 As seen below, within Central America, Belize’s top exporting partner is Guatemala accounting for 84% of total exports. Belize’s Top Imports from Central America in 2015 were butanes, shrimp feed, cartons & boxes, articles of plastics and fertilizers. 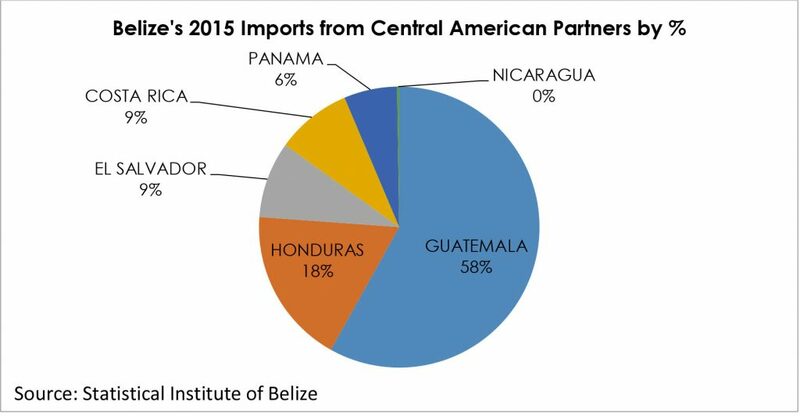 As shown in the chart below, Guatemala accounts, once more, for the largest percentage of Belize’s import trade from Central America, followed by Honduras representing 1/3 of Guatemala’s total percentage with 18%. Guatemala is Belize’s largest trading partner in the Central American Region accounting for more than half of total Central American Trade. This is mostly as a result of the land border shared between both countries making both markets relatively accessible. An additional factor is the fact that Belize has established a Partial Scope Agreement (PSA) with Guatemala which allows for the importation and exportation of a limited set of goods agreed upon at a lower or duty free rate. The number of goods that receive such preference from Guatemala amount to seventy two (72). Since the PSA entered into force in 2010, Belize’s average export trade with Guatemala is US$14 million.